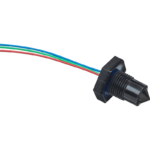 How SST's Optical Liquid Level Sensors work using our Optomax Basic Sensors and a testing kit. Demonstration by Paddy Shannon, Technical Director. Hi, I’m Paddy Shannon. Technical Director here at SST Sensing. Today I’m just going to do a quick demonstration of our Optical Liquid Level Sensors and just to show you how versatile they are. Now, traditionally when you want to measure or detect liquid, and that’s what these sensors do, they detect whether a sensor is air or a liquid. The traditional technology is a float switch. Now a float switch is quite large, they are typically around this kind of size. They have to protrude into the air where you want to measure liquid and they have got moving parts. And of course, having moving parts is always an issue because that is something to wear out or to get jammed or broken, or maybe it might freeze and get stuck in place. 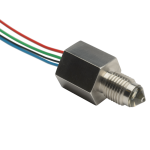 Our Optical Liquid Level Sensors are typically very small. Here is one here which is attached to a tester which will buzz and an LED will illuminate when it is wet. And you can see that this is one of our smallest sensors. This little bit here, just the cone. This is the actual sensing tip. What’s happening inside is we’ve got an infrared LED and an infrared phototransistor. The light from the infrared LED comes out, bounces around the inside face of the cone and back to the detector when the sensor is in air. And that is because of the difference in the refractive index between the plastic, which the housing is made of the atmosphere outside. But when we put it into liquid, and it is really any liquid, a lot of that light escapes. We see a smaller signal coming back to the detector and the microprocessor inside the sensor the looks at that and says well I must now be in liquid. And changes the output state accordingly. So, we are going to test it here. In first of all, water. We can see that worked. And the next one we have got is vegetable oil. That also works. Then we have got some anti-freeze. And then we have got some brake fluid. And finally, this is one we are very pleased with, is we can detect milk. Now traditionally detecting milk is difficult because it is a reflective material, so a reflective liquid. Milk is a reflective liquid and the problem with milk typically, with this type of optical sensor, is that when the light escapes into the milk it then bounces off all of the fat particles and comes back in and the sensor thinks it is in air again. But with some clever software that we have developed for this sensor, it can reliably detect milk. So that’s it, very simple, the sensors are very versatile and you could see there and I’ll demonstrate that again. They only have to detect in a tiny amount of liquid to make the sensor actually actuate. Unlike a float switch which would actually have to lift from here to here. Which would require quite a large amount of liquid. So, they are great from detecting in really small, liquid leaks for example into cabinets. We sell a lot of sensors into telecoms cabinets, where we are detecting the instant any rain water gets into the cabinet so that someone can go and fix it before damage occurs to the inside of the electronics. They also operate from -40°C up to 140°C. All sorts of shapes and sizes, different cable lengths. We do different connector styles, different materials which are suitable for different chemicals. Including Glass Tips which are obviously extremely robust and can handle virtually any liquids and very corrosive acids. 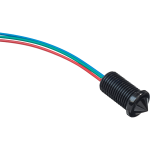 So that’s it, SST’s liquid level range of sensors. Very versatile, very reliable. Ideal for applications with restricted space that require a miniature, low power, low cost sensing solution. Designed to offer industrial supply voltages and outputs that can directly drive higher power loads. 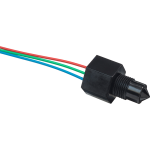 The Optomax Basic range of liquid level switches are an analogue optics only solution designed to meet the demand of price sensitive, high volume OEM applications.